The Space Vector PWM VSI Induction Motor Drive block represents a classical closed-loop Volts/Hz control drive for induction motors. The block contains a closed-loop speed control with slip regulation. The speed-control loop outputs the reference motor slip, which is added to the measured rotor speed to obtain the reference frequency of the stator flux. The reference stator voltage is derived from the Volts/Hz control and from the constant flux strategy. The stator frequency and voltage references are then used to obtain the required PWM signals for the inverter following the space vector modulation strategy. The main advantage of this drive compared to vector-controlled drives is its implementation simplicity. However, as with most scalar-controlled drives, the dynamic response of this drive is slow due to the inherent coupling effect between the torque and flux present in the machine. 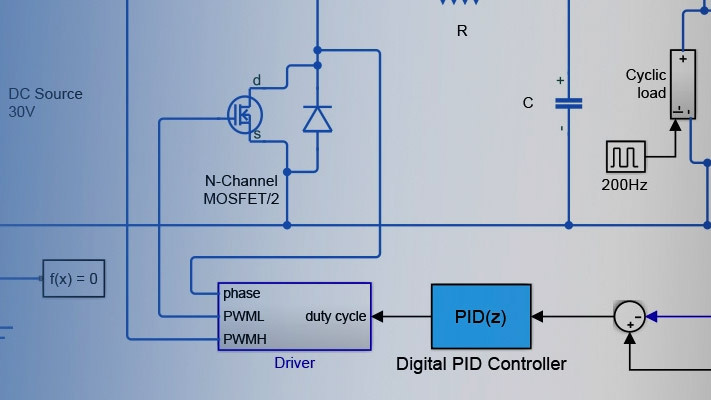 In Simscape™ Electrical™ Specialized Power Systems oftware, the Space Vector PWM VSI Induction Motor Drive block is commonly called the AC2 motor drive. The speed controller sampling time has to be a multiple of the space vector modulator sampling time. The latter sampling time has to be a multiple of the simulation time step. The simulation step size must be chosen in accordance with the inverter's switching frequency. A rule of thumb is to choose a simulation step size 100 times smaller than the switching period. If the simulation step size is set too high, the simulation results can be erroneous. The average-value inverter allows the use of bigger simulation time steps since it does not generate small time constants (due to the RC snubbers) inherent to the detailed converter. For a controller sampling time of 20 µs, good simulation results have been obtained for a simulation time step of 20 µs. This time step can, of course, not be higher than the controller time step. Select how the output variables are organized. If you select Multiple output buses (default), the block has three separate output buses for motor, converter, and controller variables. If you select Single output bus, all variables output on a single bus. Select between the detailed and the average-value inverter. Default is Detailed. Select between the load torque, the motor speed and the mechanical rotational port as mechanical input. Default is Torque Tm. This mechanical system is included in the motor model. For the mechanical rotational port, the connection port S counts for the mechanical input and output. It allows a direct connection to the Simscape environment. The mechanical system of the motor is also included in the drive and is based on the same differential equation. If you select the motor speed as mechanical input, then you get the electromagnetic torque as output, allowing you to represent externally the mechanical system dynamics. The internal mechanical system is not used with this mechanical input selection and the inertia and viscous friction parameters are not displayed. When you select this check box, the Motor, Conv, and Ctrl measurement outputs use the signal names to identify the bus labels. Select this option for applications that require bus signal labels to have only alphanumeric characters. When this check box is cleared (default), the measurement output uses the signal definition to identify the bus labels. The labels contain nonalphanumeric characters that are incompatible with some Simulink® applications. The Asynchronous Machine tab displays the parameters of the Asynchronous Machine block of the Fundamental Blocks (powerlib) library. The Converters and DC bus tab displays the parameters of the Universal Bridge block (diode bridge configuration) of the Fundamental Blocks / Power Electronics library as well as the DC Bus and Inverter (Three-Phase) blocks of the Electric Drives / Fundamental Drive Blocks library. When you click this button, a diagram illustrating the speed and current controllers schematics appears. The Controller tab displays the parameters of the Speed Controller (Scalar Control) and Space Vector Modulator blocks of the Electric Drives / Fundamental Drive Blocks library. The speed or torque set point. The speed set point can be a step function, but the speed change rate will follow the acceleration / deceleration ramps. If the load torque and the speed have opposite signs, the accelerating torque will be the sum of the electromagnetic and load torques. The mechanical input: load torque (Tm) or motor speed (Wm). For the mechanical rotational port (S), this input is deleted. The three phase terminals of the motor drive. The mechanical output: motor speed (Wm), electromagnetic torque (Te) or mechanical rotational port (S). The motor measurement vector. This vector allows you to observe the motor's variables using the Bus Selector block. Note that all current and voltage values of the bridges can be visualized with the Multimeter block. When the Output bus mode parameter is set to Single output bus, the block groups the Motor, Conv, and Ctrl outputs into a single bus output. The library contains a 3 hp and a 200 hp drive parameter set. The specifications of these two drives are shown in the following table. The ac2_example example illustrates an AC2 induction motor drive simulation with standard load conditions. Bose, B. K. Modern Power Electronics and AC Drives. Upper Saddle River, NJ: Prentice-Hall, 2002. Grelet, G., and G. Clerc. Actionneurs électriques, Éditions. Paris: Eyrolles, 1997. Krause, P. C. Analysis of Electric Machinery. New York: McGraw-Hill, 1986.